Looking for the right home to buy in California has its difficulties. What is most important to you? What is a must-have and what is a want? How much can you really afford? What are your realistic financing options? These are just a few of the questions that are likely on your mind. The good news is that you have professionals to answer all your questions and walk you through the process. At Berkshire Hathaway HomeServices California Properties, one of the things we encourage our clients to consider is the landscaping and other water conservation issues. Read on to find out more about this topic. Then contact us at 310-373-0021 to get started. It wasn’t long ago that artificial turf was a joke in the real estate world. It looked bad, it was hard to keep clean, and it was not a realistic option. 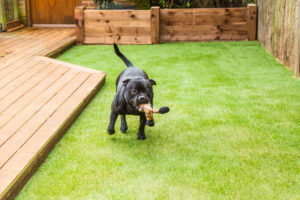 Those days are behind us, as quality artificial turf is now available. It looks and feels just like real grass and pets can even use it to do their business. It’s a great option to significantly reduce your water bill compared to a lawn you would need to water. If the home you are buying has a pool, consider a solar pool heater. Look for other solar options like solar hot water heaters. Most homes in California can create a ton of solar power – so much so that it can be sold back to the state. There are also rebates available to make solar power a more affordable option to install after you move in. Just keep in mind that if you choose a shaded property, solar power will be difficult or impossible to use. There are many water conservation additions that can be included in the home. For example, a low-flow shower head gives you the water pressure you want while using much less water. Today’s toilets generally have two settings, one for a low flush and one for a larger flush. Clothing washers should be high efficiency – the list can go on and on. If you go into the home-buying process with the idea that you must have a home that is already out fitted with the latest in water conservation measures, then you are likely to end up with very few options. On the other hand, if you are willing to make a few changes when you move in, then your pool from which to find the perfect house will be much larger. When you work with Berkshire Hathaway HomeServices California Properties, just let us know that environmental factors are a priority. We can look for homes that already have these fixtures installed but we can also look for homes in which it would be easy to make the conversion. Contact us at 310-373-0021 now for more information.